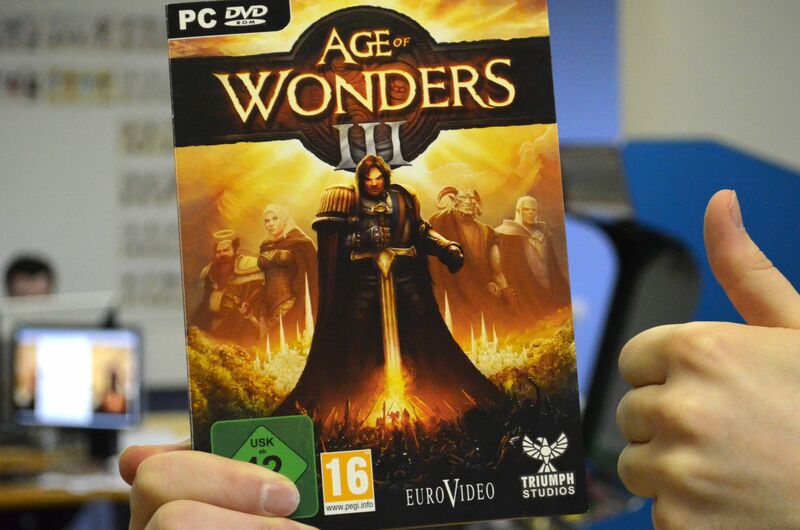 You might have already seen Age of Wonders III available for pre-order on Steam or GoG, something we’re very excited about since we are digitally self-publishing the game world wide. Additionally the game is distributed in retail with the help of a number of co-publishing partners across a large part of Europe, which is also very cool since nothing beats seeing your box neatly stacked on the shelves in a retail store. Below you’ll find an overview of everything you wanted to know about our partners, the Special Editions and retail versions. In addition the regular edition with flap box, we have prepared a great special edition with EuroVideo featuring a figuring of Elven Court hero Sundren riding a Wyvern as well as a Physical double CD Soundtrack + the Digital deluxe Content. This edition is set to sell out quickly! 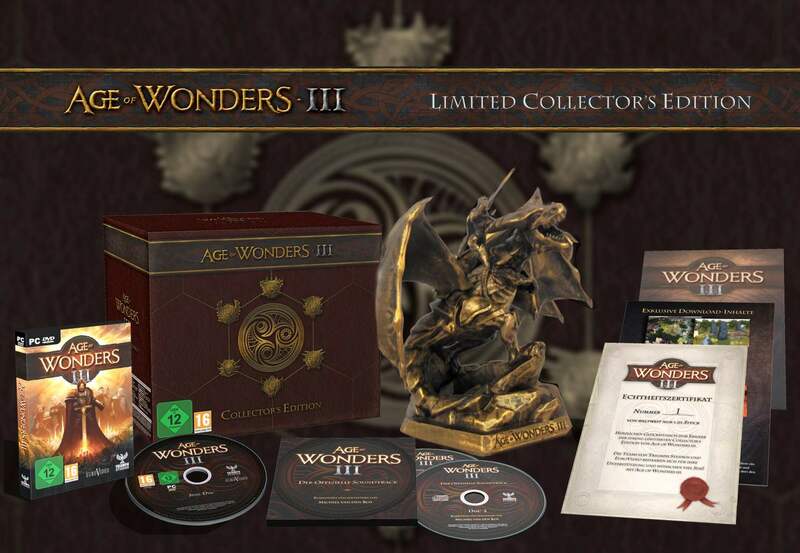 The German Limited Edition, notice the cool 15cm high figurine with heroine Sundren! The fold-out flap box carton, used in most countries. Techland: Poland, Czech Republic, Hungary. Regular Edition and a Special Edition with Audio CD posters, guide and stickers. 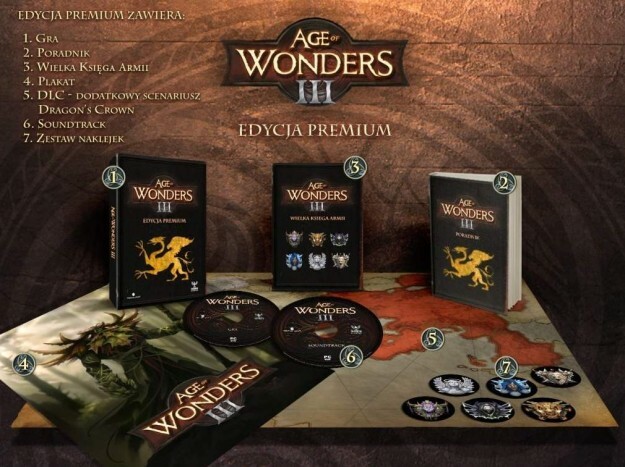 The Polish Special Edition, double CD OST, posters, stickers and guide. Regular + Special Edition. 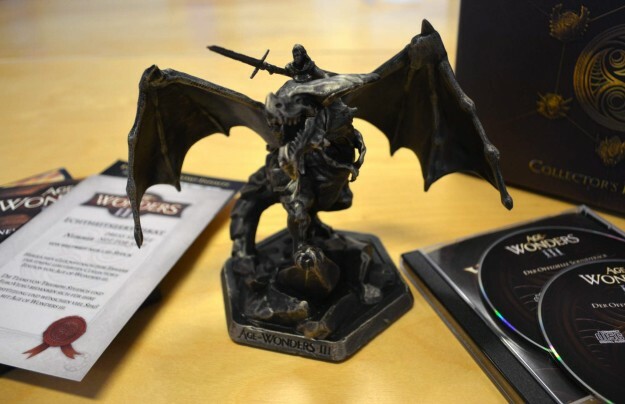 We’re still awaiting exact details of the contents, but there will be a regular special edition that includes the soundtrack and Dragon’s Throne scenario. Q: So why isn’t the game available in retail shops in more countries? We focused on countries where (strategy) PC games retail is prevalent and healthy, which pretty much is continental Europe. In the US and UK, it’s a challenge to get new full price PC titles in shops these days. We also had to limit the amount of co-publishing deals, due to internal overhead. Q: Can I buy a physical copy from another country? Q: Why did you include an in-game manual, not a physical one? We live in 2014, with games being supported and updated after release. A printed manual would be outdated the moment it is sent to the printer. The digital manual, called the “Tome of Wonders”, displays actual game variables for things like units and spells, to ensure all data is up to date. Most importantly, it is super convenient to browse using hyperlinks and search functions from within the game. Q: Why did you Steam-wrap the retail copies? The Steam platform has many cool features, including features that make our lives a lot easier in regards to distribution. Did you know this decision allowed us to spend a month of additional development on the game? The game is subject to a day one patch upon activation. Doing retail without Steam would mean we’d have to lock the build a month earlier for manufacturing! Hello longtime lurker and first time poster here:) I just have a question about the retail version of the game. If i buy the psychical retail version here in sweden can i still play it on steam? The game is subject to a day one patch upon activation. Doing retail without Steam would mean we’d have to lock the build a month earlier for manufacturing! But, in this case GOG version will also be subject to day one patch, so there is no difference if you go Steam or not. If you wouldn’t go Steam on retail copies then those retail players who wants to have up-to-dated game would still need to download day one patch. You could always work on the game (that last month) until release and post day one patch, regardless you use Steam or not. Isn’t it? I don’t see anything for our friends in the UK nor USA? Do they have seperate distributors or online only? Seems like the UK & US have been left out, understandably. “Q: So why isn’t the game available in retail shops in more countries? @kat For a non-Steam disk a day one patch can’t be auto-triggered upon activation (unless we’d write a Steam-like client). The EuroVideo paragraph has a typo in it. Figuring should be figurine. March 31 can’t come soon enough. The waiting has become physically painful. I live in the UK, only comprehend English, and have an XP PC. The Amazon French version is being advertised as being only Windows 8 complient. So what would be best for me – wait another month for a German ??? version, or risk downloading a maGoG version ? That Amazon.fr listing is not correct, thanks for letting us know. Should have the system specs as listed on this website. Looks like I made the right decision ordering the Eurovideo edition! I would love the Techland books (ideally, a guide or an artbook would be nice with the EV edition), but I wouldn’t be able to understand a word. Shame Namco won’t release a Special Edition in Europe. There is in europe a collectors edition right? I think he means the one’s published by Namco Bandai. I was hoping for them to release one too. I understand about no English edition being shipped to stores, but why can’t there be an English boxed edition that you could buy online? You did all the other languages in boxed, well a lot of them, you are basically cutting out all English speakers from the collectors edition. I guess I just don’t get that. Sorry or this example, but do you think you will sell more boxed editions in Poland than you will sell of English editions worldwide. U.S. England, and Australia? @ ffbj, this argument seems…familiar. @ffbj the other editions were done in cooperation with local partners. the logistics of doing an online distributed physical collectors edition ourselves would be too much for us to handle. When getting into physical goods, everything gets so much more complex, including warehousing, customs, returns handling etc, etc. to give an example, we got a bunch of collectors editions in today and its just amazing the amount of space they takes up. I understand. No partners in the U.S. or England to assist in the publishing. I get they take up a lot of space and all that. I just did not understand that to publish an English edition you would have to self publish. Which makes sense, except that there must not be anyone with enough horse sense to co-publish an English edition. Perhaps after it’s a big hit you can find someone that will co-publish in English. I will buy 10 copies of a English boxed edition, and give them to friends. Yes, I really do have 10 friends, well, acquaintances. I know that does not matter much, but I hope it all works out for Aow III. Thanks for taking the time to clarify my confusion on this matter. BBB. Guess we are in the same boat. So there’s no chance of a Collector’s Edition in English? You can probably cancel it, no? What is the chance of getting the chance to buy English versions of art books and posters? I love, LOVE art books and would proudly display a aow3 poster in my new office. I’d gladly drop more money for such things. Clothing too, like polos with class symbols or even keychains. 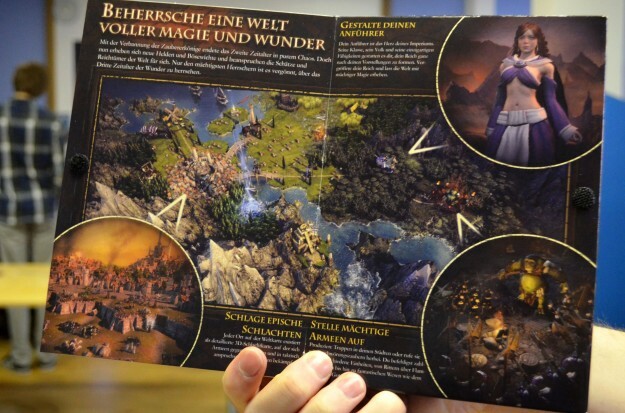 On the french boxed edition it say it include the elven resurgence scenario, and in the deluxe edition on steam there is the dragon’s throne scenario include, are those 2 scenario the same ? And if i buy the german collector edition will i be able to install the game in french by steam ? Please tell me to now if i order it quickly ! @xerox They are different Scenarios. You can install the German edition also in French! 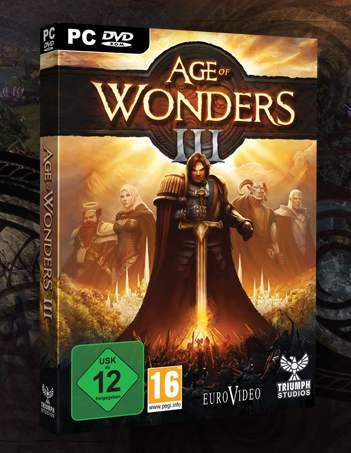 What a sad day, when we have to learn that after all these years there will be a new AOW game and a new collectors’s edition in a shiny box which might have joined all my other AOW boxes. I own all AOW titles since the first game in boxed form and also bought them again at gog.com for convenience and to support the genre. Why do publishers never learn that there are still a lot of people out there who would pay premium prices for premium games but do not want to be forced to use third party spyware/software like steam? You could just have added a steam key to the retail boxes and made the whole steam thing optional for those who want/need it! And don’t come up again with the day one patch argument – that is no reason for a game being tied to steam! Even in the good old steam free days lots of other publishers were able to just offer the latest patch on their websites… and since you are offering the game on gog.com too, I hope that you will not treat your customers there with less support i. e. you SHOULD offer them a day one patch at the same time your steam customers will be able to get it! I’m from Spain, I would like to order the retail box edition, I don’t care if it is regular o deluxe edition, I would prefer if it is deluxe but…, at least should be in english and online playable, someone of the staff could tell me which is the best choice because I’m a little bit confuse, thank you in advance.